Race for the Cure 2010 – Get your pink on! 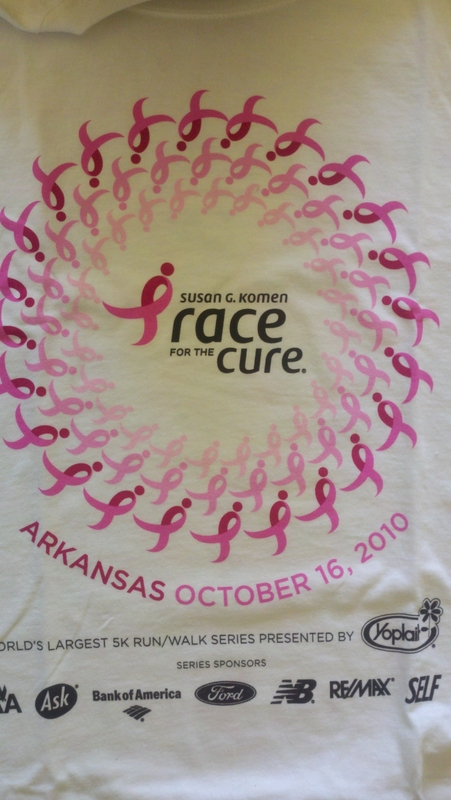 I got my Race for the Cure shirt in the mail yesterday, which means it’s almost time for the big event. This year’s event is October 16th. It is my third year to run in the Little Rock Race for the Cure, a race that I am absolutely in love with. I’ve blogged about it before here and here. The big draw for me is the purpose of the event (fighting breast cancer via screenings and research), which creates an electricity in the crowd that is palpable. Over 40,000 women came downtown last year to take part. You’ll float from the race expo with tons of cool giveaways (and the fanciest port-a-potties you’ll ever see), to the stage with the bands, through the mass of estrogen at the starting line, past three miles of men (including firemen, bikers, shriners, musicians, and of course all those kids and daddies) cheering along the way, and on to the grand finale: the pink wave of the survivors’ parade moving down Broadway. This year I’m running as part of the KTHV/MomsLikeMe.com team. It’s a great opportunity to join up with other moms for a great cause. I’ll be running the race, but other team members will be jogging or walking the 3.1 mile course, and others will be doing the 2k family walk/run with their kiddos in strollers. If you’d like to join the team, you can get more information here, and register for the event here. If large events aren’t your thing, or you just can’t make it, you can also donate to the Komen Race for the Cure through my fundraising page. Wednesday, September 22nd 6:30-8:30 @ Go! Running: GET YOUR PINK ON! Ladies Night Out. Come on out to the Go! Running store for a fun evening of fashion, food, and facts (about Race for the Cure) Go! 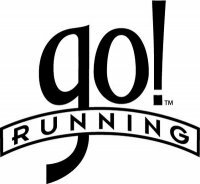 Running will be offering some great discounts on their apparel and shoes, and you’ll even have a chance to win a pair of New Balance shoes! If you’re on Facebook, you can learn more and RSVP here. So, maybe you’re not into running or walking, but we can all spit, right? Spit for the Cure recruits females 18 years and older to contribute a DNA sample (by spitting into a tube) and answer a short questionnaire. This will be used to create a “bank” of information for future studies. You can Spit for the Cure at the race, or you can contact Dr. Martha Phillips if you would like to participate via phone at 501-526-6413 or via email at mmphillips at uams dot edu. Dillards is hosting Fit for the Cure at various locations across the state. A $2 donation will be made for every Wacoal & b.tempt’d bra fitting, plus an additional $2 donation for every bra or shape wear sold. Check with your local Dillards to see if they are participating. In Central Arkansas, the McCain Mall Dillards’ event will be October 7th. Park Plaza Dillards’ event will be October 8th.